Got A Saab? We’ve Got You Covered! Whether you’ve been a Saab owner for decades or you’ve just got your first Saab to stand out from the crowd, we bet you are a proud and loyal champion of the Saab brand. Saab is a unique, European car with a long and interesting history. Owners today want to keep their Saabs running in the best possible condition but may also be uncertain about where to get it serviced. If this is you, Indian Peaks Auto is the place you want to be! Saab has introduced a wide range of automobiles over the years ranging from sporty to compact, hatchback to a sedan. It is common to see older, imported models, vintage classics, and more recent Saab designs based on General Motors products. No matter the type, Saab owners seek safe, reliable, and solid-handling with their cars! Like even the best cars, every vehicle will experience problems without regular maintenance and with day-to-day wear and tear. 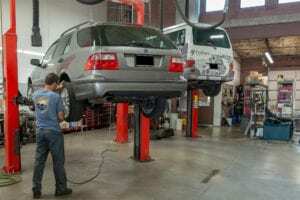 For Saab owners, it can be a challenge to find a reliable service center that understands how to diagnose, service, maintain, and repair a Saab. Indian Peaks Auto offers more than 20-years’ experience in serving the Boulder community and surrounding areas, keeping Saab cars safe, efficient, and with great performance. Our team can service any Saab make or model and has the technical experience, great value, and outstanding warranty to ensure you feel confident with your car! The team at Indian Peaks Auto has more than 100 years of combined technical expertise and is proud to service Boulder customers as one of the area’s top-rated auto shops for Saab service! Our full team of Saab service mechanics is here to provide you with fast service, professional insight, and quick repair that you can trust out of our established Boulder, Colorado shop.